Speaking of Daniel Craig, as the actor milled around the set in full cowboy attire, we couldn’t help but notice the similarities between him and Steve McQueen. Jon Favreau: Yeah. He looks – he looks remarkably like, you know, Steve McQueen did in the ’70s. It’s interesting, because you think of him as James Bond, but the minute you put him in – you’ll see him in his whole kit, as he calls it – his whole outfit – and he feels really, you know, like the type of actor that you could cast back in the ’60s or ’70s. And we looked at films like "The Professionals," "Magnificent Seven." But the first meeting I had, along with Bob Orci and Alex Kurtzman and Damon Lindelof and with Steven [Spielberg] – he screened "The Searchers" for us. So I definitely watched and went through the whole John Ford, you know, all the John Ford films I could get my hands on. And also some [Sergio] Leoni. But they all – each era did their version of a very similar structured story type, so we tried to preserve those archetypes in those characters, and figured it’s time for our generation to take that class historian, and show it through our perspective. And there was a big gap, because I don’t think people accepted the Western the same way that they had pre-Vietnam, just because it felt a little insensitive, racially, at times, in who the bad guys are and what they represent. And as archetypes, it all worked very well, but as people became more socially conscious, it didn’t – some people found it distasteful until you lost a whole tradition of the Western because it became – it felt anachronistic. And then action movies took over, or cop movies or vigilante movies, or sci-fi, would take those archetypes and stick them in space. Now we kind of go back to the old Western and because now you have bad guys that are Aliens, it’s not racially divisive anymore. And actually we have – the story’s about the Apaches and the cowboys being forced to deal with one another. So we tried to start it off with this – as real as we could historically, and as real as we could, in the context of the Western, the traditional Western film. And it’s interesting to see how these characters are forced to interact with one another based on this looming threat. It was an expression during the Cold War that said the only way Russia and the United States were going to get along and make peace is if a spaceship came and attacked the Earth. You know – a common enemy is – it’s interesting to examine all those characters in a strained situation, and try to play that out as real as we can. Favreau: Yeah, we had – well, Ron Howard, certainly. You know, with "The Missing" and "Far and Away" and just a student of it. And Spielberg knows – he’s encyclopedic with his knowledge of it, and he’s even – I think when he was 16 he met John Ford and got some advice from him. So that’s been it. And then watching them, listening to commentaries. And there’s even like online – I’ve listened to that whole series of online Western mythology of the Western. Q: University Professor of iTunes – yeah. Q: Is all into the Western. Favreau: We’ve been listening – if you follow Olivia Wilde’s Twitter, she’s – I turned her on to the iTunes U and she’s been taking like Yale courses. [laughter] In her trailer. But there’s a whole series from Wellesley in that. One of Alex’s old professors, his partner’s old professors, would show a Western and then talk about the context and the mythology and – studying the genre of the Western. So I’ve been hitting it from all ends – just watching them, commentaries, talking to the experts, and then even listening to lectures on it. 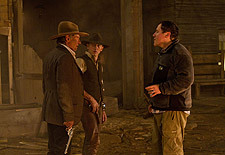 This is Cowboys & Aliens, so we had to ask Favreau about the alien and UFO elements in this Western. Favreau: The first shot of a UFO was like a cigar-shaped silver thing in the air And there have been certain recurring themes and sightings and – and then the way film has treated them, UFOs. So we tried to use – reference stuff and make it fit into the cultural memory of alien stuff, especially – you know, I’m more of a fan of the alien movies from – you know, I guess I grew up around the time of "Close Encounters," "E.T." and then "Alien" I like a lot, and "Predators." So we’re definitely going for more of the horror side of the alien movies, and although we have quite a bit of CG, I like the way they told stories before – before you could show everything with CG. And it was a real unveiling of the creature, little by little, and using lighting and camera work and music to make it a very subjective experience. And so we tried to preserve that here, even though we have ILM and we could show everything from the beginning, it’s nice to let things unfold, in a way, especially because you’re seeing through the eyes of these people in this Western milieu. Q: Was it a challenge finding a unique alien design, something that hadn’t been done before? Favreau: Yeah, it’s very hard. Actually, Steven Spielberg was very involved at that point. And it’s hard to have a brainstorming session with Steven Spielberg because he’ll start talking about, "Well, in ‘E.T.’ I did this, and then in…" You know. And then you’re just – it’s hard for you to – it’s hard to not be distracted by that, you know. [laughter] You know, because you’re hoping those stories will come up when you sign on to work with these people, and between Ron Howard and Steven Spielberg and Harrison Ford, half of what’s fun about this project is just getting to know these people and be colleagues with them, and getting to either get their advice because they’ve done so many of these films. You know, talking about an action sequence, the way you break something down with Harrison Ford. Between "Indiana Jones" and "Star Wars" and the Jack Ryan series, he really has a real deep understanding of filmmaking and how to make action scenes work. Usually the actors I work with are really tuned into dialogue and character, but he really understands the whole overall of it. So I’ve learned a lot from him and of course, Spielberg and Ron Howard. Just talking about film theory or storytelling, or what would be exciting; and then hearing stories about what they’ve tried and how they did it. And me being able to pick their brain about, "How did you do it, either back then, or what’s worth exploring now?" And then sharing the resources of people that they’ve worked with. It’s just been – at this point in my career, it’s really a welcome – a welcome new layer to add, to be able to actually have people that I can ask questions of and who know so much about making movies. Q: How much of a story are you giving the Aliens? Do they have a purpose for being here? Favreau: They do. I mean, we have an internal logic to it. But definitely, in again, the movies that I like, it’s not like you’re going to be cutting to the bridge of the alien ship… [laughter] Like in the "Treehouse of Horror." [laughter] It’s more like – you can infer certain things. Again, to me once of the best examples is "Alien." There was a logic to it, but the way it unfolded, you didn’t really know it. And there was enough logic to it that you could accept it. But all I knew when I watched it is, "Oh, my God, what’s that? There’s eggs; it’s on his face." [laughter] It’s coming out of his stomach. And they’re all over the place, you can’t kill them; they have acid blood. Those were things that were pulled together, saying what they were colonizing. But I really liked the experience, and how the actors, and how Sigourney Weaver was going through it, and how much it was affecting her – the nightmares she was having. And then as you – and the more I learned about the aliens, the less I enjoyed them. Like when they were these horrific images that – these very real characters I was investing in, were reacting to – even in the second one, you know. You’ve got a sense that it meant a lot to them. And I kind of got what they were about. But I, as curious as I was, I was more curious about the moments of the actors, and how it affected them. And I would say the same thing about "Predator." I guess they were coming here to – I mean, the alien movies I liked the most, I don’t know that much about, and the ones I knew more about – it got away from horror and more into sci-fi and action. I think as movies like that get into sequels, you start to have to reinforce the mythology. But in the first one, you can surprise people and come at them from all angles, and I think that that’s what’s fun about this; it was fun about a movie like "Cloverfield." It was a logic to it, but all I knew was it was really cool and I was really scared, you know. 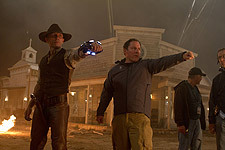 As you may or may not know, Cowboys & Aliens started as a comic book idea. We asked Favreau about the freedoms and constraints of doing another comic book movie. Q: Now, this is based on a comic book that’s not that well known as opposed to, say, "Iron Man." Q: Do you feel a lot more freedom, working with a less known comic? Favreau: Yeah, I mean, honestly I was exposed to it. I knew the title, I knew the image of a cowboy running away from a flying saucer, it’s pretty cool. And then Mark Fergus and Hawk Ostby had been attached to the film when I was writing "Iron Man" – and they had written "Iron Man" – well, when I was making "Iron Man" they had written "Iron Man" and I had heard about it, and had a meeting with Spielberg about it – I thought it sounded really cool. And then for a while, Downey had even met and was attached to it, before "Sherlock 2" happened. So I heard about it again. And then I met Kurtzman and Orci at Comic-Con last year, and just – we had a general meeting and they mentioned that that was one of their projects. And I said that’s one I’d always heard about, that Downey had been attached and Fergus and those people attached. And they sent me the script, and it was really the script that – it was a real page turner. I was like – after "Iron Man" and "Iron Man 2" where it evolved from outlining to just as the bell rang before we started shooting, into a shootable script – it was nice to have a piece of material before we ever started the casting or prepping. And it was a very strong script. So I don’t know that much about the comic book, but I do know, you know, we definitely reinvented things, from the images that I’ve seen. Q: In the comic book some of the death scenes are pretty graphic. Did you use that as inspiration at all? Favreau: I really used the scripts more than the comic book. You know, I read their script and I operated from there. I know a few pages from the comic; I think they have like magical horseshoes that make horses fly in the comic book. Is that right? Q: That’s the sequel, yeah. Favreau: So I think it’s more the concept, and for a comic book that was good. But for a movie, you have to – the tone I think has to be different. We wanted to keep it much more classic, and that had more of a cartoony feel. Favreau also talked about the work that went into his Comic-Con preview clips and how their positive reception helped inspire the cast and crew. Favreau: But I have to say, this is a – it’s been a really, really – so far, it’s been as positive experience as I’ve ever had, as far as the material that I’ve had to work with, the producers, the type of support I’ve gotten from the studio; the actors are talented and everybody is really enthusiastic. And I’ve shown them some stuff and brought them to Comic-Con, and we got a little taste of – you know, we really put something that’s very indicative of the film out there. It was long, it was like ten minutes long. It didn’t rush. We let the Western part of it play out. We introduced essentially what the sci-fi part would look like. And we put it out there. And it’s hard to put something out there that early, because if it had been rejected, it would have been hard to really gather ourselves back up and keep pressing forward with all the hard work we had. But we really showed something that was indicative of what I told the actors the movie would be. And then for that crowd to accept it with open arms – being that they had no frame of reference for it whatsoever. And they really, you know, it’s that kind of enthusiasm that you only get in that kind of environment. It showed us that people liked what we were doing; we were doing what we set out to do. And it just made, ever since then – as hard as it was to get that stuff ready for Comic-Con, and from the first meeting I had with DreamWorks, I said, "We have to figure out a sequence to get ready for this date, and let’s back into that." So we were working six day weeks, which is very hard on everybody. And we got it done. And after that, it was a real sense of relief and fun, as we came back and everybody’s reading online how it went. And it just was one of those wonderful experiences where even though people had to work that weekend to go there and come back, and there was people who’d never been there before, like Daniel and Harrison. And really, the crew even more than the cast, got to see that piece and I think that they were excited that they were doing something that they felt proud of. And so the whole experience has been good, and I would – if there’s any way to feel it again, you know, it’s something I wouldn’t run away from – it’s something I would embrace. Q: Does the importance of [Comic-Con] get blown out of proportion, outside of the scale of, you know, the interaction between you and that particular audience? Favreau: It depends. If you’re relying solely on that, it’s bad, I think, because it’s – because that group of people will be there. But when you’re dealing with movies of a certain size, you have to appeal beyond that core group. But I think, especially like superhero movies have ignored that core group for so long and said, "Look, that group is just X amount of dollars. We need to get everybody else who’s never read these comic books. So we could change arbitrarily whatever we want to from the comic books." And I think when Marvel formed their studio, they set out to say, "Hey, let’s not ignore the source material." And the experience with "Iron Man" showed me that if you take that base and you build out from it, it’s better than ignoring that. Because I understand what that group likes. And if I could, if it could ripple out from that group, then you could let other people like it, too and make it accessible, it’s good. But when you only hit that group, you could be the hit of Comic-Con – it was the same thing in independent films – you could be the hit of a festival, and the minute it hits the multiplexes, the movie dies in the third week; once you platform out, the movie goes away. So the trick is to get that core to like it, and what they’ll do is they’ll at least be vocal about what it is, so if people are curious about the film, the word of mouth will spread out from there. But if those people who hear the word of mouth don’t care about it, it’s not an interesting concept, if they don’t like the people who are in it, then they won’t come. So you can’t trade one for the other, but I think it’s a great place to start, and the easiest place for me to start because that’s – I share the taste with those people. I don’t share the taste of the people who are in – high school students who are, you know – my head’s not there anymore, right? Like I would want to check out "Piranha 3D," but I don’t know that I could make that movie. But I get why it’s appealing, and I would want to check it out, but I wouldn’t want to live two years of my life making it. But I would – but I see movies, you know, I see what they’re doing at Comic-Con, the movies that are a big hit. I see a movie like "TRON" coming out and it’s getting a big buzz there. That’s a movie I think is cool. That is one I would want to work on. And I actually think that one’s going to spread out from that core group. But because they planted their flag in San Diego and showed the footage, and people who are meeting up on it are hearing it’s good – I think it’s going to – I think it will help outside of that. Favreau also surprised the visiting press with a little gift, something very unusual for a set visit. Favreau: In the military – when we would work with the Air Force a lot, on "Iron Man," "Iron Man 2," we were at Edwards Air Force Base. And I would shake hands with people, and I would feel they would stick a coin in my hands, right? And it was a challenge coin. The reason they call it challenge coins is, if you don’t have your unit coin, or a unit coin with you when you’re out drinking, and if anybody in the bar doesn’t have a coin, they have to buy a round for everybody. But if you challenge everybody and everybody has it, you have to buy the round for everybody. But it was also a sign of respect, that they liked the way the crew was, and the way we treated them. It was a sign of respect to give a coin. So I had them made up for "Iron Man 2.". And it became like a tradition. So I had them made up for "Cowboys & Aliens" also. Cowboys on one side and Aliens on the other, and it says, Director Jon Favreau. So sometimes when people visit, we work with people, I’ll give them – and it’s a nice thing because it says you visited the set, you can’t get it anywhere else. So I got it for you guys. You’ll see a photo of the coin on the side. I’m showing you the "Cowboys" side, but not the "Aliens" side that depicts one of their ships. After all, Favreau wants to keep a few surprises on the big screen, right?